Are You Flossing The Right Way or the Wrong Way? Yes – there is a correct and incorrect way to floss your teeth. This is separate from brushing your teeth. Most people try to lump brushing and flossing into one, but that’s not how it should be done. Brushing is and will always be separate from flossing. This isn’t to say that brushing your teeth is bad; it’s necessary! Flossing is just as important as brushing, and patients need to understand this. Too often we run into a situation where a patient either is unsure of how to properly floss their teeth or won’t floss at all. There’s no harm in not knowing the correct flossing technique, that’s why we’re here to help! If you’re one of those people who is unsure of how to properly floss your teeth, you’ve come to the right place. Our Ft. Collins, CO office has the preventive dentistry services that can help keep your oral health in fantastic shape. As part of our general services, we can train you on how to practice good oral habits. Flossing once a day is good but if you’re not doing it correctly then what’s the point? We’ll help you head down the path to excellent oral health with our flossing recommendations. Dr. Lindsey is the dentist Fr. Collins residents can trust. Flossing helps keep food particles and other harmful bacteria out of your teeth. You might not know this, or maybe you do, but a toothbrush can only do so much for your teeth. Yes, it removes tooth decay that can cause cavities. Yes, it helps keep your overall health in great shape. 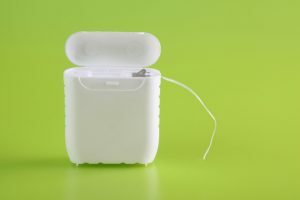 However, it can’t get the job done alone – that’s where flossing comes in. It can reach places a toothbrush simply can’t. A toothbrush’s bristles are too soft and don’t have the appropriate length to fully clean in between teeth. If you don’t floss, you’re only inviting bad things to happen. What kind of things? Flossing properly isn’t hard to accomplish, it just takes a little time and dedication. We recommend flossing at least once a day, but you can choose to do more if you wish. As long as you have the correct technique down, you’ll see results. Stretch a good amount of floss out – about 18 inches worth. Wrap each end around your middle fingers leaving roughly an inch of space in between. Use a gentle sawing motion as you make your way in between your upper and lower teeth. Curve the floss into a “C” as you make your way to the gum line. Floss underneath the gum line to remove hidden tooth decay. It’s common to see bleeding in the gums after flossing, so don’t worry! It’s a necessary task for everyone to complete in order to experience great oral health. Our office can help with any dental problem you may be experiencing. We can answer any questions and address many concerns. If it’s a flossing refresher you need, don’t be embarrassed to ask us for help! We’re always here for our patients in any way we can. Trust Dr. Lindsey and her staff – they’re the dental experts! Comments Off on Are You Flossing The Right Way or the Wrong Way?